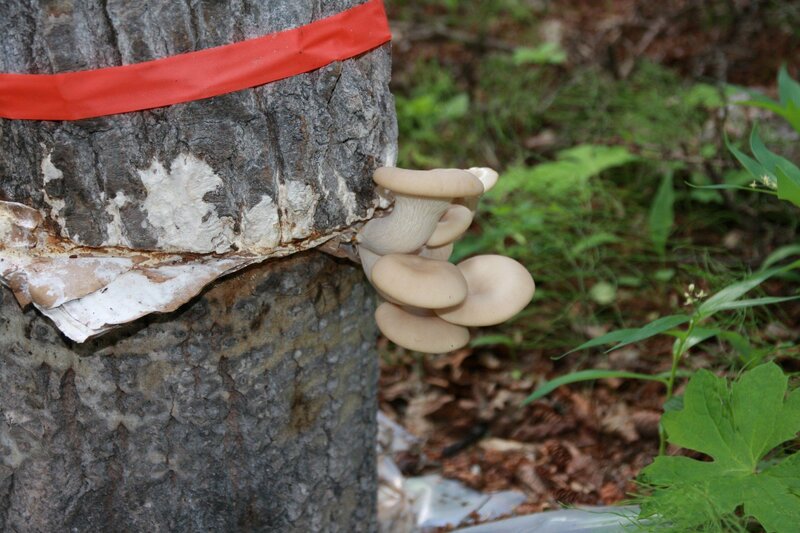 Building a stack is a faster and easier method of growing mushrooms on logs and is well suited for several species including oyster mushrooms and lion’s mane. Essentially, the method involves creating a ‘layer cake’ of short sections of a log stacked vertically on top of each other with a layer of spawn spread between each section (the filling). 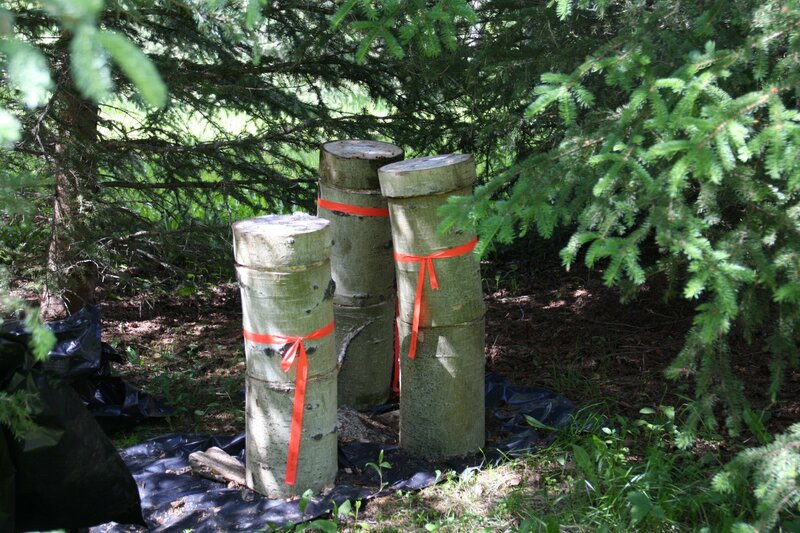 We recommend making your stack in the spring when the tree can be felled before green –up (or leafing out). The climate is relatively cool and damp in the spring and there is plenty of good weather for the mycelium to establish before winter. Place your stack in a shady spot that provides a relatively cool, moist microclimate for the fungi to grow. Examples include under a tree, in a forest or a shady, protected spot created by your house or garage. Logs should be cut from a healthy living tree ideally in late winter/early spring while still dormant. The tree should have no signs of other fungi. For our own experience, we find the best logs are from a healthy tree cut down in the spring before the tree leafs out but after the sap is running. We live in an area that is slightly cooler than nearby cities so when the trees in the city leaf out, we know we have about one week to cut down our trees. You can use sawdust spawn to inoculate your log. If you use grain spawn it is more likely to be eaten by critters (see varition below for using cardboard inoculated with grain spawn). Place the second section on top making sure to align the vertical lines on each of the two sections that you drew earlier so they fit in their original orientation. Repeat this process until all sections and the cookie are reassembled. Once fully myceliated, remove the bag. Unlike ‘logs’ you don’t need to trigger the mushrooms to fruit with an influx of water, rather wait for a good spring or fall rain during cooler temperatures to trigger them for you! We have seen pictures of people using paper instead of plastic. Give it a go!